Birdhouse or “Bottle” Gourd Seeds 5335. Lagenaria are hard shelled useful gourds. They grow much like squash and cucumbers. Directly sowing seeds into warm, well drained soil is best where the growing season is at least 100 days long. Seeds do not germinate well in cool soil. Late sowing usually does better than early sowing. If you need to get a head start, plant seed indoors into peat pots. Leave pots in a warm, brightly illuminated place. 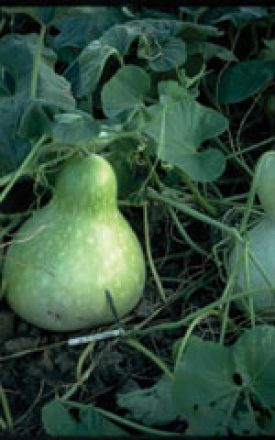 As gourds resent transplanting, the use of a peat pot that may be directly planted into the garden, without disturbing roots, is recommended. You may want to try growing on a low trellis. Irrigation is essential for best growth. The ‘Birdhouse’ or ‘Bottle’ gourd blooms at night. For a unique visual treat we suggest planting them near patios and decks where night-time ambient light will catch the white blooms opening. Gourds are a hot weather crop. They need full sun and deep, rich, well drained, organic soil with a pH of 5.5 to 6.5. Before planting, work in lots of compost. Directly plant seed outdoors in late May to June 2.5 cm (1″) deep in hills 2.4 m (8′) apart with 4-6 seeds per hill. After germination, thin to 3 plants per hill. Seed can be started indoors 3 weeks before the plant out date. 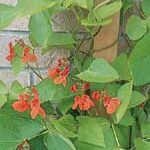 They do not transplant well–use paper or fibre pots that can be set directly in the soil. Protect mature fruits from frost and cold temperatures.. How to prepare gourds for making birdhouses. Harvest gourds after the vine has withered but before frosts occur. Leave a portion of the stem attached. Before starting the curing process wash down the gourd with a sterilizing solution of 1 part bleach to 10 parts water. After that hang the gourds in a warm spot or lay them out on newspaper (turning them frequently). Curing can take anywhere from 3 to 6 months. Sometimes gourds develop surface mold as they dry – this is neither uncommon nor unexpected. If mold does show, wash the gourds with the same sterilizing solution as before. Throw out gourds that wrinkle or develop soft spots during the curing process. Once the gourd rattles when given a good shake it is ready.